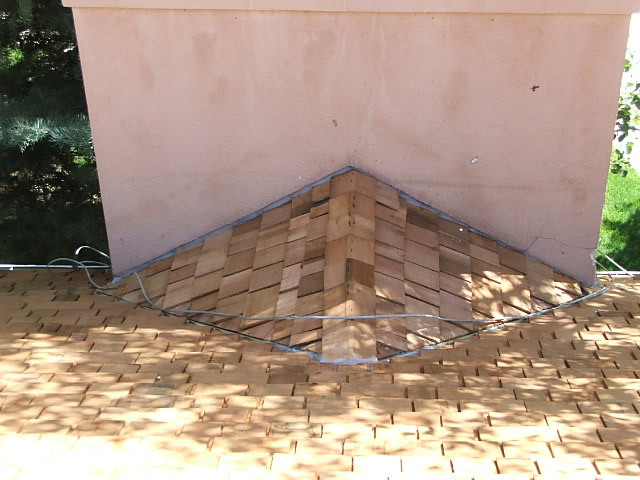 We remove bees from attics, wall cavities, and outdoor locations. Our experienced professionals know all there is to know about how to get rid of honeybees, and also how to prevent them from coming back. For this project we had to remove a lot of honey as well as remove the honeybees. The white material is wax. Bees produce the wax, build the comb, and fill each cell with nectar to create honey. Bee extermination is necessary when the bees are Africanized, or when the colony is built in such a way that it cannot be relocated. 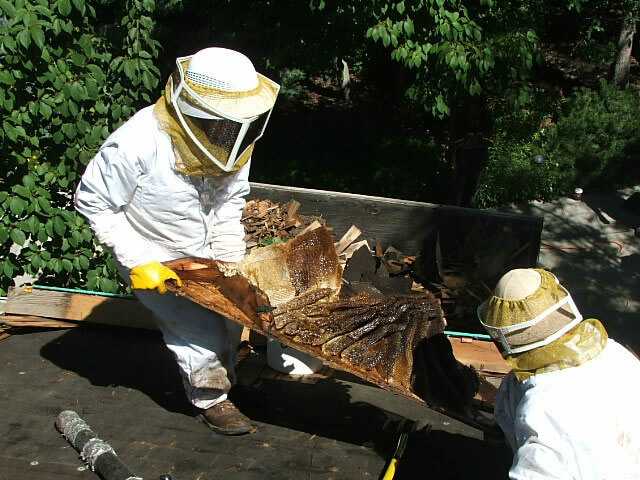 Honeybee removal projects typically involve a lot of bending and heavy lifting. Need to get rid of honeybees in your area? Use our nationwide directory of wildlife control operators to locate a professional trapper near you. There are several insects collectively referred to as “bees”. This page is about honeybees, not wasps, hornets, carpenter bees, or yellow jackets. Honeybees are wonderfully useful creatures, creating honey and pollinating numerous kinds of fruit, flower and vegetable crops. Humans rely on them for much of our food production. However, they can sometimes cause problems and create a real nuisance. What harm do honeybees cause? Build homes inside walls, chimneys, or eves. Bees like wall cavities and chimneys for the same reasons they like hollow trees: such places are dark, quiet, dry, and safe. They are defensive of their homes and may react to people or pets who get too close, or whom they perceive as threatening. It is also possible that they will chew through a wall and enter the building. Cause structural damage. 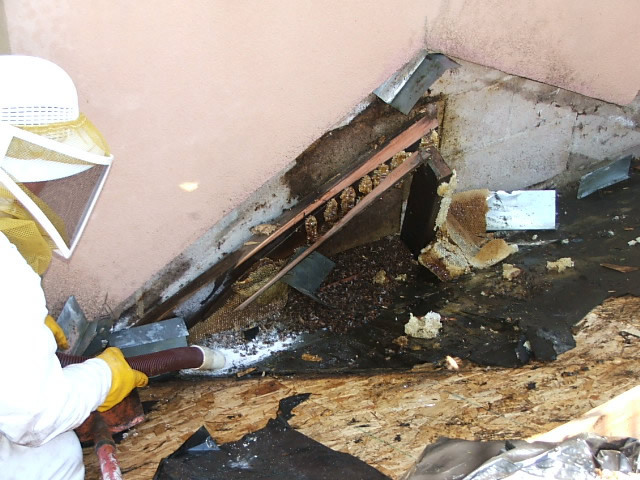 A colony inside a wall cavity is potentially hazardous to the structural integrity of the wall. The accumulation of wax and honey can become quite heavy, to the point of collapsing the wall. Make a sticky mess. On hot days, honey may leak out of the chimney or wall through the wallpaper or baseboards and into the home, creating a mess. Attract rodents and insects. Honey attracts bees and wasps like a magnet. Wax and honey can become rank and attract a variety of other insect pests as well, and also rodents. Waste buildup, dead bodies, shed larval skins, and wax cappings further attract moths and beetles. Create an odor. Bees, honey, and wax do not produce a particularly offensive odor, but if the bodies of dead bees are not removed they can stink like any other decomposing material. Sting. Bee stings cause itching, irritation, redness and swelling. To an allergic person, stings can be fatal. Call Allstate Bee Control: 1-888-488-7720. Sometimes people will try to solve their infestation problems themselves. I understand their desire to save a few bucks, but these homegrown methods simply do not work and often make the problem worse because they do not really understand how to get rid of bees. One common mistake people make is trying to seal the entire colony in. If the insects can’t get out and can’t get in, they think the problem is solved. The reality is that access is only half of the problem; the other part is the wax, honey, and bodies that are left stuck inside. Bees can survive for months inside a wall before dying of thirst or starvation, after which time they will begin to rot and smell. Also, without live bees to maintain the combs, the wax will more easily melt or fall, causing mess, damage, and drawing many more smaller insects and bacteria to the decomposition and rank smells. To solve this problem, complete bee control is needed. 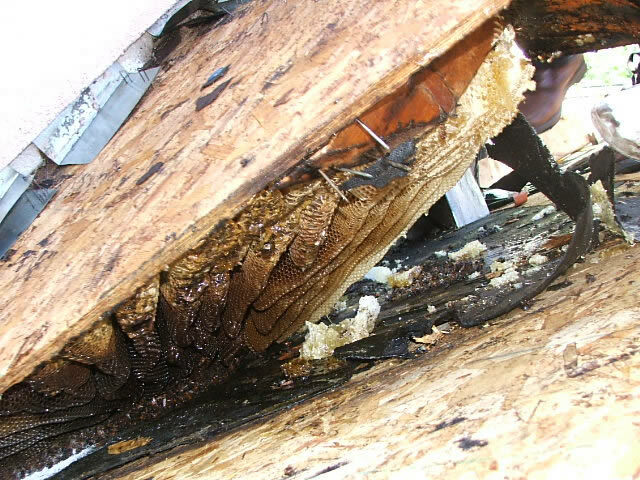 This includes opening the area (perhaps removing siding or sheetrock), removing the honey and the insects and the beeswax, and cleaning the space. Then the cavity must be filled to prevent more insect from coming to this attractive location in the future. 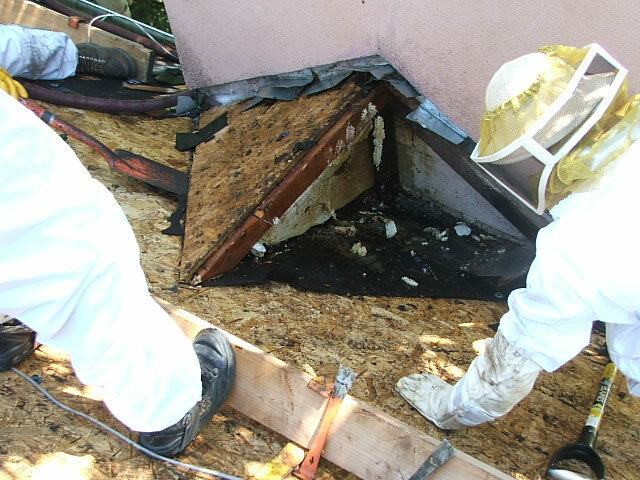 The easiest way to fill the cavity is usually with fiberglass insulation. Our technicians can perform all of these services for you. After filling the cavity, it is wise to seal or screen all holes or cracks that lead into it. Mesh openings should be smaller than 1/4 inch. When kids, pets or allergies are present, take these precautions to keep everyone safe. Africanized honeybees are very similar to ordinary honeybees and are indistinguishable to the naked human eye. The venom of an Africanized bee is the same as that of a regular honeybee, so a reaction to either type of sting would be the same. The difference between the two is in their behavior, with Africanized ones acting much more aggressively than the others. Ordinary honeybees will only sting an intruding person or animal enough times so that the disturbance will go away; Africanized ones are different because many of them will pursue and attack the person or animal for a quarter mile or so. It is not uncommon for their stings to number in the hundreds or thousands. If Africanized bees are near your property you have a serious safety hazard on your hands; bee extermination is necessary and the sooner the better. Enough stings from any kind of honeybee, Africanized or not, can ultimately kill a person or animal. Sheep, dogs, and large animals such as horses can all be lethally stung. A non-allergic person weighing 100 pounds would typically need to receive around 1,000 stings or so before they would be fatal. Do not put up with nuisance bees any longer! 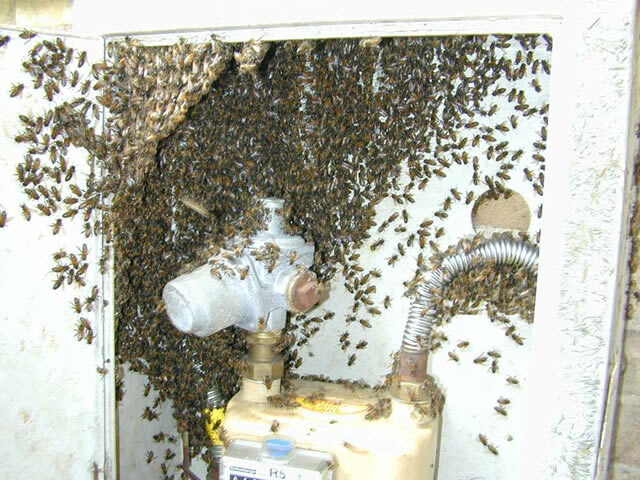 Call Allstate Bee Removal: 1-888-488-7720. You may send us 5 to 10 digital pictures of your honeybee problem and we will give you a FREE cost estimate over the phone. Prices will vary depending on the severity of the problem and on the time spent on the job. Wild animals can be unpredictable; every job is unique and our solution will be custom fit to your situation. Check with your insurance for coverage. Read more about this pest animal at our Honeybee FAQ. We also offer expert coaching services for a fee, so you can do the job yourself. We can even ship the necessary materials to you to help you do the job right. We accept Visa and MasterCard. We also accept purchase orders and cash. A swarm of bees is very intimidating and can be dangerous, even deadly. Call a professional for bee removal. Our technicians protect themselves from bee stings by wearing proper protection. 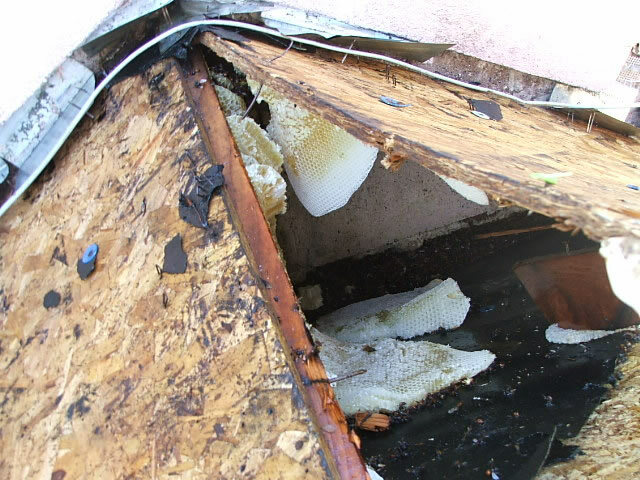 A customer asked us to get rid of the bees that were living under this roof. Honeycomb, when filled with honey, is quite heavy. It is not uncommon for a single hive to hold 100 pounds of honey. 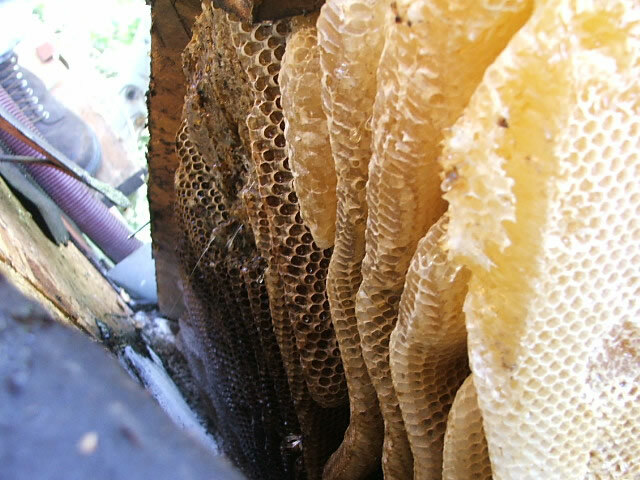 The bees had attached their comb to the underside of the sheeting. 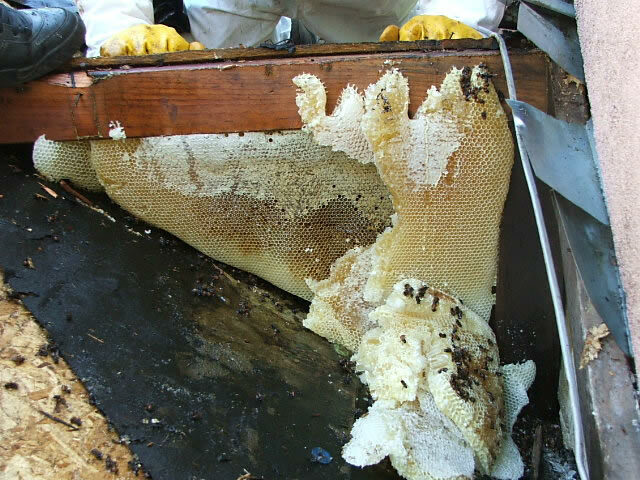 In order to provide effective bee control, we had to remove the sheeting completely and get all the bees and honey out. You can't just get rid of the bees and leave the honey. Other bees will smell it and be attracted to the same location. 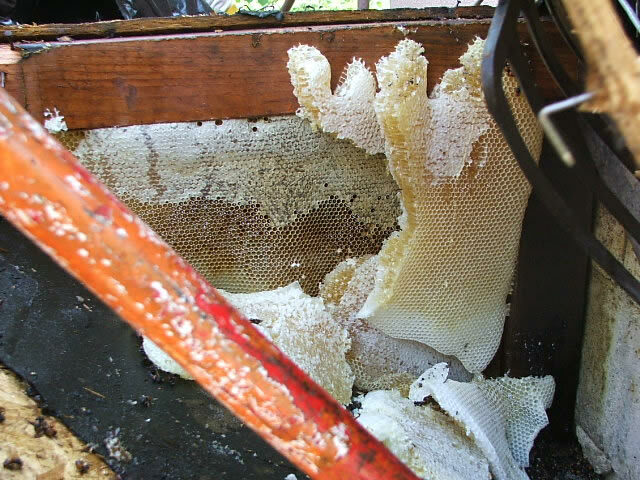 We took out quite a bit of wax and honey during this honeybee removal project. Once the honey was out, we still had a lot of mess to clean up. We thoroughly cleaned every affected surface. 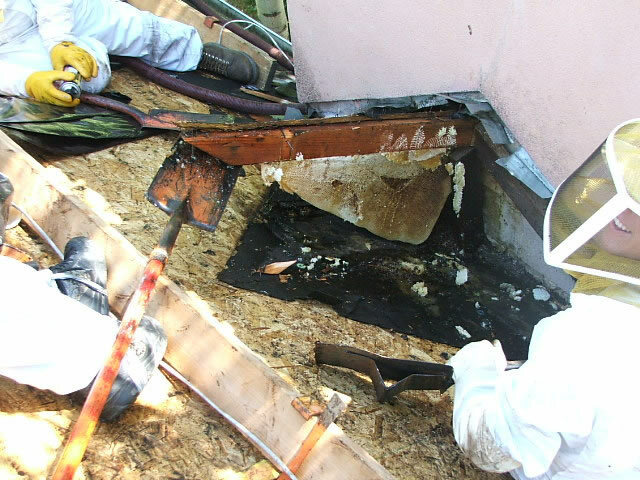 To prevent bees from coming to this location again we sealed everything up and rebuilt the damage section of the roof.